The launch of Taylor Wimpey’s exciting new Admirals Quarter development in the attractive village of Holbrook in Suffolk has moved a step closer – with construction work now well under way. The leading local housebuilder began work in October at this superb collection of 78 properties off Ipswich Road, which will comprise of a selection of wonderful two, three, four and five-bedroom homes in a range of detached, semi-detached and terraced designs. Property-seekers will soon be able to take their pick from these fabulous homes, with the first plots due to be released for sale in the summer. Anyone interested in finding out more about the exceptional new homes at Admirals Quarter is urged to register their interest now. Caroline Carter, Regional Sales and Marketing Director for Taylor Wimpey, says: “We’re really pleased with how things are coming along at our brand new Admirals Quarter development. Taylor Wimpey will provide financial contributions to the local community as part of the new development, including more than £30,000 to local facilities to improve existing public services and infrastructure. 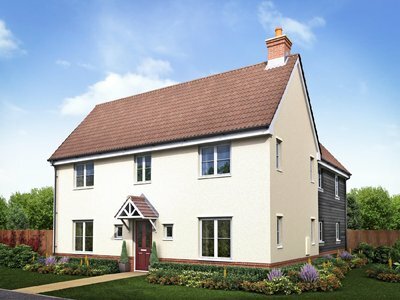 The first housetypes to be unveiled at Admirals Quarter are the three-bedroom ‘Melford’, the four-bedroom ‘Mistley’ and ‘Langdale’, and the five-bedroom ‘Wilton’, offering something for purchasers in a wide range of circumstances. Prices will be available when the first plots are released for sale later in the year. Taylor Wimpey will also offer a range of helpful homebuyer incentives, including Help to Buy, Part Exchange and easymover. Admirals Quarter enjoys a highly desirable setting in the village of Holbrook, surrounded by the rolling farmland of the Shotley peninsula, which is situated between the rivers Orwell and Stour, with their sailing marinas and delightful views. The village has plenty of local amenities for day-to-day living, and good road links across the area, yet it’s the perfect place to retreat to from the hustle and bustle of modern life, set against the backdrop of country lanes and the peaceful Suffolk countryside. Families will appreciate there are good local schools for all ages within walking distance. Both Holbrook Primary School and Holbrook Academy for secondary-age students were rated ‘good’ by Ofsted in their most recent inspections. Sports facilities are also good, with the Peninsula Sports Centre also just a walk away in the village. Ipswich is less than six miles from home while the A14 and A12 are also just a few miles away for links to London, East Anglia and the Midlands. Ipswich railway station, meanwhile, provides direct services to London Liverpool Street, Norwich and Cambridge. To register an interest in the new homes coming soon at Admirals Quarter, property-seekers can visit the website at taylorwimpey.co.uk.